Sleepwalk with Me is a great sophomore effort by comedian Mike Birbiglia, who takes on the role of director/writer/producer/actor in this charming and funny semi-autobiographical comedy. Ultimately, the film becomes an admirable, but flawed piece of work. The comedy bits work well, but the overall story leaves something to be desired. Comedian Mike Birbiglia crosses over into the world of film with his semi-autobiographical comedy Sleepwalk with Me. The film follows struggling comedian/bartender Matt Pandamiglio as he deals with confusing dreams and sleepwalking as poking relationship stresses start weighing down his life. The more Matt stresses over marriage and life-long commitment the more his sleeping becomes erratic and the more his life as a comedian gets brighter and brighter. Sleepwalk with Me is charming and funny and shows promise for Birbiglia as a filmmaker. Matt Pandamiglio (Mike Birbiglia) is a bartender with dreams of becoming a comedian. He does five minutes here and there between serving drinks and cleaning up puke in the bathroom. His career is at a standstill and he needs to do something to shake himself out of this life-living coma. His relationship isn’t doing much better, with his girlfriend Abby (Lauren Ambrose) of eight years wanting marriage and possibly even kids. Matt’s day-to-day pressure is building up and it finally starts to reveal itself in the form of crazy dreams and even weirder sleepwalking patterns. His father and mother urge him to seek medical help, while his girlfriend just wants him to be happy, but Matt doesn’t really see the need to react just yet, instead focusing on his comedy and the potential success that may come of it. Mike Birbiglia follows fellow comedian Louis C.K. in bringing his work to more people in a variety of mediums. Birbiglia wears all hats on the film, acting as director/writer/producer and star of the film. By doing so he guarantees the comedy to be funny and the story to be true and far from your normal Hollywood production. 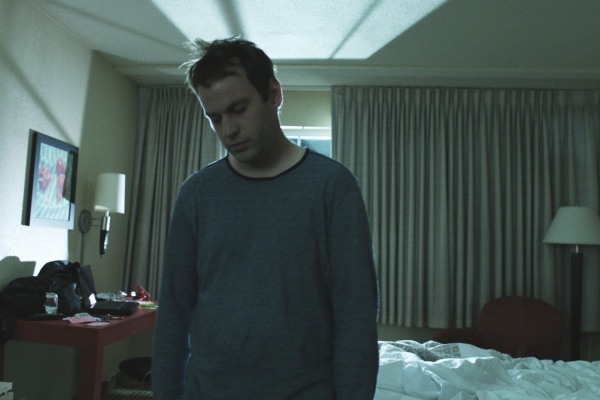 Sleepwalk with Me also happens to be sort-of based on real-life events, so Birbiglia seems to be approaching the entire project with an advantage of having total creative control over something that actually happened. This translates well for the film, because the moments where Birbiglia is staring at the camera and commentating on the events unfolding are the film’s finest moments. Birbiglia’s nonchalant characteristics help build Matt into a likable and understandable young guy that just doesn’t seem motivated enough to get the things he wants out of life. Birbiglia understands the balance of comedy and reality and that helps make almost every character relatable on some level. The film excels in character work and comedy, because of Birbiglia’s major involvement in the film. His co-star Lauren Ambrose makes for standard girlfriend affair, occasionally adding some turmoil and drama to the film’s center relationship, but Sleepwalk with Me is most interested in focusing on Matt’s life. The jokes in the film mostly work because of on-time delivery by Birbiglia and that shouldn’t come as a surprise since he comes from comedic roots. This isn’t a laugh-a-minute film or something that will have your gut hurting by the closing credits, but there’s not a lot of dry moments until the film’s clunky and almost anticlimactic third act. For whatever reason the film comes to halt after a cruise-control of laughter and equally important character progression. Suddenly things start to wrap up at an alarming rate and important subplots mash together to create a satisfying, but almost underwhelming ending that feels dropped in when compared to the film’s pace up until this point. Running time is very important for comedies, because no one likes to sit through a film and not be entertained. Comedies don’t usually boast impressive cinematography or Oscar-caliber performances, which means you’re mostly counting on the jokes to remain funny and fresh. Sleepwalk with Me loses some of that freshness once Matt reaches a specific turning point in his life and from that point on the film struggles keeping its footing and closing strong. It leaves something to be desired, but it still feels like a great sophomore effort by a very talented individual. Sleepwalk with Me makes me excited to see Mike Birbiglia’s next directorial effort, because the man clearly possesses a lot of talent and understanding, not only as a comedian, but as a full-fledged filmmaker. Sleepwalk with Me is a funny and charming comedy that deserves more credit for its behind-the-scenes construction by Mike Birbiglia than its actual long-lasting impact as an indie comedy. It’s a great debut, but it does show areas that Birbiglia will need to work on in order to become a better filmmaker, both in front of and behind the camera.